That Ubisoft’s upcoming pirate adventure Assassin’s Creed IV: Black Flag will feature multiplayer – that feature’s been a celebrated fixture of the franchise since 2010’s Assassin’s Creed: Brotherhood. Still, fans of the franchise have been curious to know what form the mode would take in the series’ newest entry. Assassin’s Creed IV: Black Flag puts players in the shoes of Edward Kenway, father of Assassin’s Creed III’s Haytham, a deadly pirate who cuts a swath through the Havana, Nassau and Kingston in the 18th century, the Golden Age of piracy. In Black Flag, the modern-day portion of the game will put players into the shoes of a research analyst for villainous Abstergo Industries, working to reconstruct Kenway’s memories, similarly to the meta-game of the multiplayer modes since it first appeared in Brotherhood. Assassin’s Creed IV: Black Flag releases on Oct. 29 for Xbox 360 and PlayStation 3, and will also act as a launch title for next-gen consoles when they launch in November. What do you think, Assassin’s Creed fans? 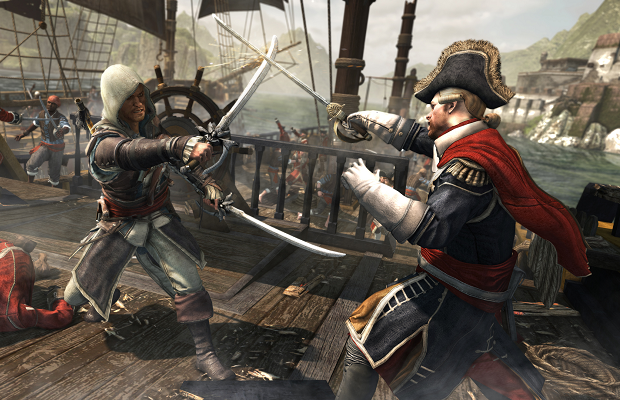 Are you excited to get your hands on Black Flag’s multiplayer mode? Let us know in the comments.